Safe Shoveling, This Winter Season. With winter creeping up on us, it is time to get that shovel out and ready for action! Before you head out, here are a few things to think about while braving cold and snowy Canadian winters shovel in hand. Pick the right shovel as they are not made the same. Here are some things to consider. A curved arm on the shovel will help you keep your back straight. A plastic shovel blade will be lighter than a metal blade. Ensure the length of the shovel suits your height, as you should not need to bend forward more than 10 degrees. A smaller shovel blade may take longer to accomplish the task but will ensure you don’t overload or overdo it when lifting and pushing the load. Try to push the snow instead of lifting it, as it will produce less stress on your body. When you need to lift the shovel of snow remember to lift by bending your knees. Lift with your legs not your back! Keep the blade/load close to your body when lifting to avoid putting too much strain on your back. Always face the snow you are intending to remove, keep your shoulders and hips square. Balance your body ... Shovel both ways. We all have a preferred side/way, but shovelling with the opposite grip and stance can help you minimize the risk of injury. Keep in mind when shoveling that wet snow weighs significantly more than fresh powdery snow. A full shovel can weight up to 25 pounds! During long storms this means going out a few times to lighten the load and risk. Pace yourself, take frequent breaks to avoid putting too much strain on you. To do this you might have to set a timer or keep an eye on the clock. Warming up before starting and starting slow are recommended to get the blood flowing and your muscles loose, while reducing strain. Ensure you are wearing proper footwear while shoveling to avoid slipping and falling. We suggest wearing boots with grips or using the boot strap-on crampons to avoid slipping, jolting and falling on hidden ice patched under the snow. If you are experiencing pain of any kind STOP! By continuing to shovel you risk hurting yourself more, listen to your body and ask for assistance if needed. Did you know your risk of heart attack, stroke, or chest pain can spike 2 days after a winter storm. This risk is greater for men. 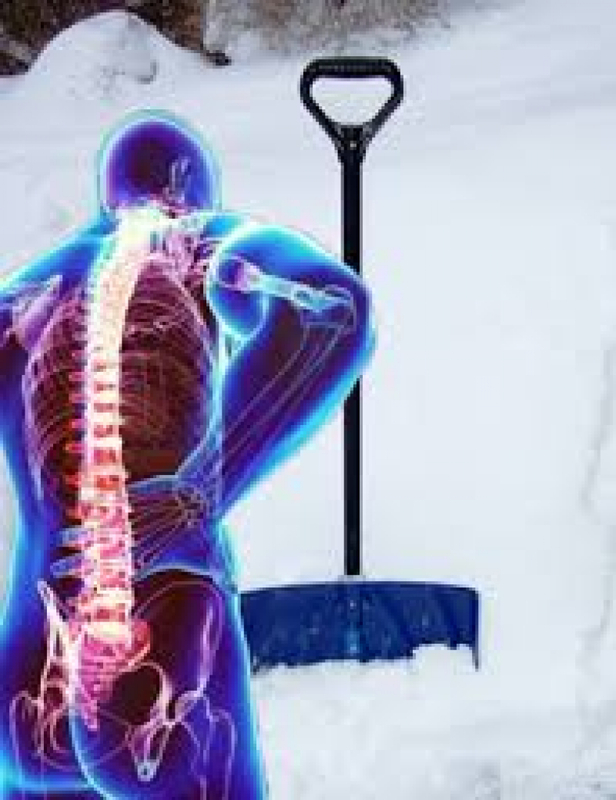 If you have any questions about your technique or need help recovering from a shovelling injury, contact us at 613-831-4054 and book an assessment with one of our physiotherapist. We are happy to assist you. Let’s brave the winter together!